In the 1950s Mighty Marvel was known by another name-Atlas-and during that era of tension and paranoia Stan Lee brought together the best and brightest artists of the era, all to scare the pants off you! 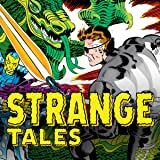 From titans of the times like Joe Maneely, Bill Everett and Bernie Krigstein, to young talents like John Romita, Gene Colan and John Buscema, they all came together to make Strange Tales one of the greatest horror mags of the day. Populated by vampires, ghouls, werewolves, mad scientists, stone-cold killers and outer space evils with an eye towards Earth, every issue brims with dark and horrific stories as could only be crafted in the days before the Comics Code. 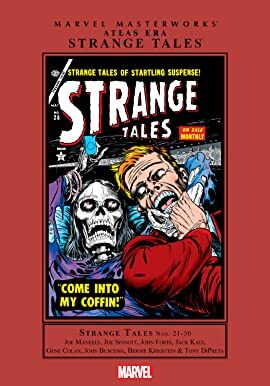 So come share a coffin with the Marvel Masterworks and take a strange trip to the time when horror ruled the racks and the only thing scarier than the stories was turning the lights out after you read them.